Enjoy an alternative sightseeing experience in Palma de Mallorca on a smooth and speedy Segway during an exhilarating and eco-friendly tour. Select from either a 1-, 2- or 3-hour tour then follow your knowledgeable guide through the charming streets of Mallorca’s capital on your self-balancing Segway. See spectacular sights like the grand and Gothic Palma Cathedral and the beautiful Ciudad Jardin beach. Personalized attention from your guide is guaranteed on this small-group tour, with numbers limited to six people. Select from a 1-, 2- or 3-hour tour in the morning or afternoon to suit your schedule. Make your own way to as meeting point in central Palma de Mallorca to greet your knowledgeable guide and collect your two-wheeled, self-balancing Segway. Listen to a comprehensive orientation session then as soon as you feel confident, set out to explore the city and its sights. Please see the itinerary section below for detailed information on each of the tour options. Follow your guide to Parc de la Mar, a recreational area with a manmade lake and an enormous fountain. Glide past the many bars and cafes and take in views of the lake, sea and port. Pose for photos in front of Palma Cathedral (La Seu). Admire its Gothic facade as your guide shares stories of its history and tells you about Antoni Gaudi — the Modernist architect responsible for many of the cathedral’s interior features. See sights such as the Arab Baths (Banys Àrabs), the grand residences of Casal Santa Euàlia and Dalt Murada, and Almudaina Palace, an ancient palace originally built by the Romans as a citadel. As you zip through the streets on your Segway, marvel at the pretty squares and churches. The last stop of your tour is Es Baluard, a museum of modern art, where you can stop for refreshments (own expense) before returning to the original start point. Begin your tour from either Playa de Palma or the city center. Zoom through Palma de Mallorca’s historical streets, soaking up the city’s must-see sights as on the 1-hour tour. Next, make your way through the charming former fishing village of Portixol and return to the departure point. Having departed from the city centre, you will be able to get to the Mallorcan capital's verdant gardens and the beautiful Ciudad Jardín beach. After some time on the beach, enjoy the scenic ride back to the city center. Your tour then departs at the original start point. 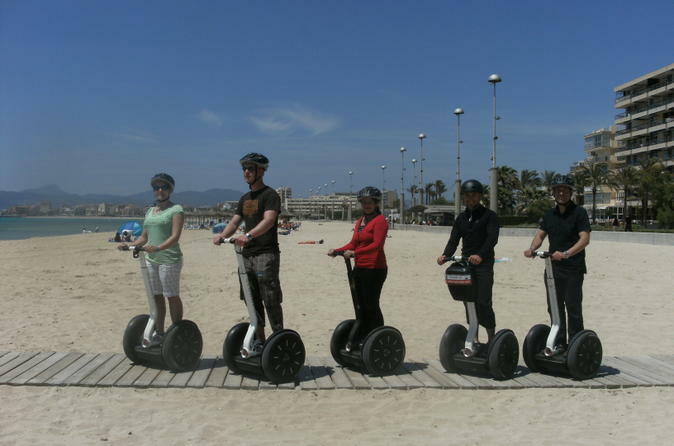 Hop onto your Segway either at Playa de Palma or in central Palma de Mallorca and then continue along the sun-kissed coast. As you glide along the beachfront, take in the gorgeous island scenery and sweeping views across the Mediterranean Sea. Pass by the yellow sands of Can Pastilla, Cala Estanica and Es Carnatge, through picturesque Portixol, to Ciudad Jardín. After exploring the beach, begin on your scenic return ride to the city center where you’ll embark on your one-long tour of Palma de Mallorca’s top attractions.